Have I mentioned how much I love pork rinds? YUMMY good! Totally just chowed down on some. I realize this is probably not a great post for a Sunday considering it's a holy day and pork is considered unclean by many. But ohmygosh I love tasty little piggies. No apologizes there. I've heard it said you can eat everything but the oink. That's so funny. Now I'm wondering where the curly-q tail goes. 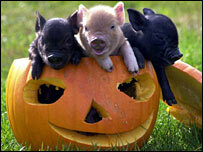 Do you know how hard it is to find cute piggie pictures? It's a crime I tell you!